Are Air Stone Bubbles a Sufficient Source? Just how efficient are those little bubbles that come out of air stones, or diffusers? Many aquarists believe they play an important role in an aquarium when it comes to oxygenation and aeration of the water, and that this air source is adequate. Not so! When it comes to the increase of DO (dissolved oxygen) in an aquarium, the water surface is one of THE main places where this exchange takes place. Oxygen is dissolved down into the water, carbon dioxide is released out into the air, not to mention that other gasses readily pass through the permeable surface of the water as well. This is the principle that our bodies work on when we breathe; good air in... bad air out. It's the same way with your tank. So, if the water surface area of an aquarium is where the main exchange of gasses occurs, then why use air stones and have bubbles in an aquarium at all? Because they do have their benefits. They are used to drive various types of filters and equipment, such as under gravel filters and some types of protein skimmers. Tanks that have solid covers or close fitted hoods on top are prime candidates for stagnant air, low oxygen levels, and high levels of carbon dioxide. However, for these types of setups that have an under gravel filter powered by an air pump, the fresh air bubbles that come up from the uplift tubes helps to eliminate these problems by provided excellent oxygen and other gas exchange opportunities. A powerhead can be used in place of the air pump and stones to run the under gravel filter, but if the powerhead is not equipped with an aeration feature, or this feature is not used, it can result in low oxygen and low pH. 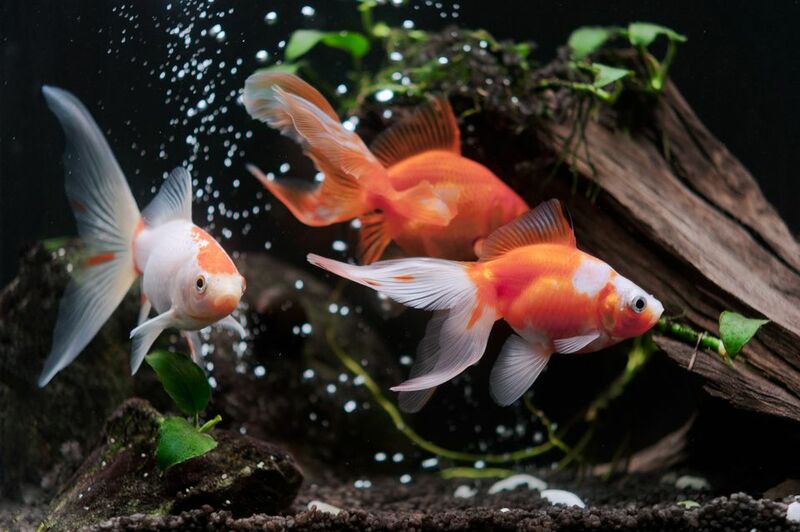 Whether using an under gravel filter or not, air bubbles help to move the tank water vertically towards the surface, assisting with oxygen and other gas exchanges. They are a cheap way to move the tank water vertically. They do create a wall of bubbles that can look pretty cool in an aquarium, not to mention that watching them can be quite soothing. Air stones can be made of ceramic, glass, or becoming more in vogue, wood. Wood stones can be easily made at home with different kinds of woods that are readily obtained, but the most common wood used is limewood. This type of air stone is supposed to be ideal for air-driven protein skimmers, and they are inexpensive to make. These air stones are also available on the market, like limewood air diffusers by Lee's Aquarium & Pet Products. Ok, so air stones do have some benefits, but are there any downsides to their use? Yes. They are not as efficient as powerheads, water pumps, and/or protein skimmers are at creating water movement in an aquarium. All of these are much better at helping with oxygen and other gas exchanges at the water's surface. They do not move water fast enough or inadequate volume for what a tank usually needs for good all round, vertical and horizontal, water circulation. This situation can also contribute to a low or insufficient GPH (gallon per hour) tank water turnover time. They create a lot of salt spray, that in turn contributes to salt creep problems. They wear out quickly and usually need replacing often. They can give off irregular air flow. Airline hoses can get pinched or kinked, which weakens or cuts off the air flow. Many times the air pump chosen to run air stones is inadequate, resulting in low air flow pressure. Some air flow pressure is lost the longer the distance the air has to travel through the clear tubing from the air pump to the air stones. The deeper the tank water, the farther the air has to be pushed downhill to reach the air stones, resulting in loss of air flow pressure. If you are using air stones for the sole purpose of aeration in an aquarium, this is may not be enough.